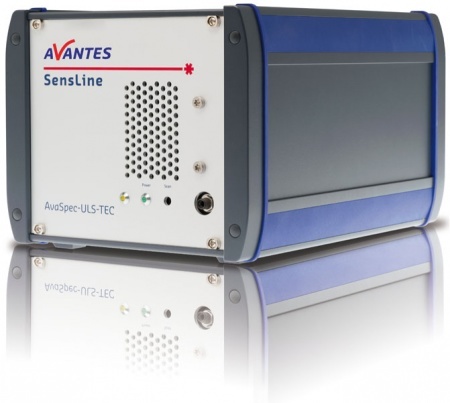 The AvaSpec-ULS2048x64TEC spectrometer is one of the newest spectrometers in the SensLine. This instrument enhances the Sensline series. With a cooled, back thinned detector.The back thinned detector has good sensitivity in the UV and IR region. The 64 pixel height (0.89 mm) enables catching as many photons as possible while the cooling enables long integration times up to 500 seconds with low noise values. This instrument features our re-designed three-stage Peltier cooling device integrated into our exclusive ultra-low stray-light optical bench, which can reduce the temperature of the CCD chip by -35 °C against ambient, improving the dark baseline and PRNU level by a significant factor. The detector cooling also reduces the dark noise by a factor of 2-3. The AvaSpec-ULS2048x64TEC-USB2 uses a special low noise version of the 2048×64 detector.All the above makes this instrument ideally suited for measuring low light applications like for instance fluorescence. Optimal flexibility is guaranteed with the (optional) replaceable slit making the instrument suitable for different kind of applications. The Replaceable Slit option is also available for this spectrometer!